We LOVE these fantastic little Coconut Date Balls. 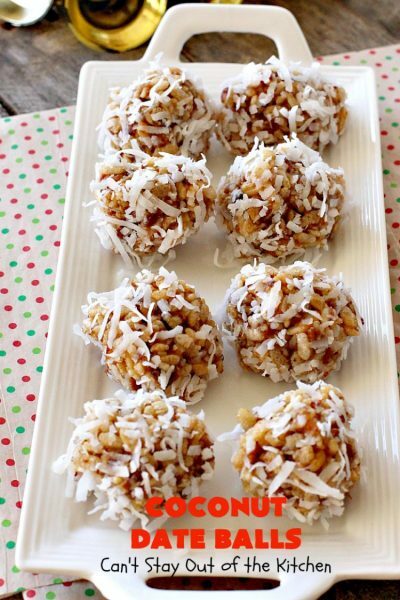 Each bite is filled with the luscious flavors of dates, coconut, pecans, and Rice Krispies so they have plenty of flavor, plenty of sweetness, plenty of crunch, plenty of satisfaction in every bite! While they take a little work the outcome and appearance of these little cookies is so beautiful and pleasant. One of the nice things about these cookies is that you cook them on top of the stove rather than in the oven. 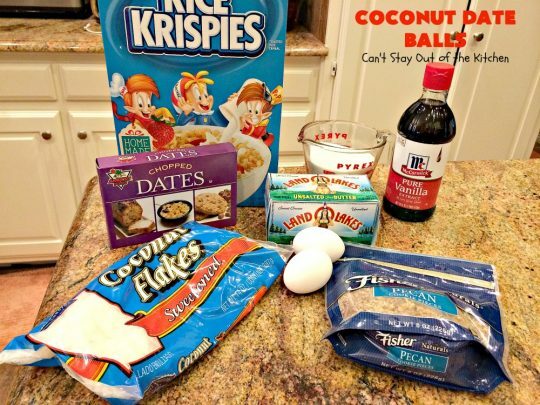 Then you stir in the Rice Krispies and a few other ingredients and roll the mixture in coconut. While my recipe is for dates, I’m sure any kind of dried fruit would work with this basic recipe such as apricots, dried cherries, blueberries, or craisins, even stuff like dried mango or pineapple might work if you enjoy those flavors. As they are, these cookies are so sensational I’m sure you’ll love them as much as our family does. She called them Skillet Cookies and that’s really what we refer to them as, but in order to be more descriptive for my blog followers I have changed the name to Coconut Date Balls since that’s really what they are. I used to like the fact that these could be a gluten free option for friends and family, but it’s very difficult to locate Rice Krispies without barley malt flavoring or malt flavoring these days (circa November 2017). So unless you can locate a truly gluten free cereal, this recipe will not be gluten free. Coconut Date Balls are a scrumptious no-bake cookie that are festive and beautiful for holiday entertaining. These cookies are also gluten free if you use true Rice Krispies cereal. Coconut Date Balls or “Skillet Cookies” are delectable holiday cookies that are a delightful tradition in our home. I hope they become a tradition with your family during the holidays, too. 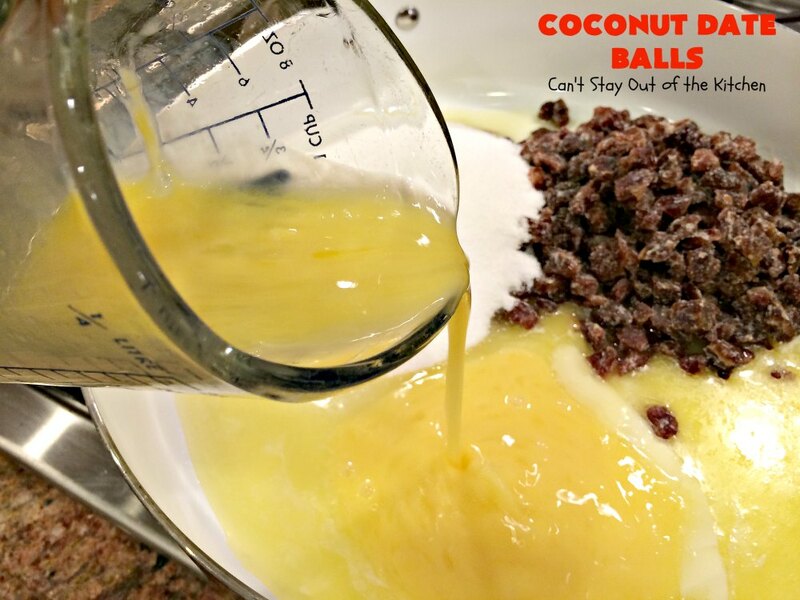 When I first posted this recipe in November 2012, I had only been blogging a few months. I was using a poor quality iPhone 3 for a camera and all my pictures were grainy, out of focus, and overly busy with Christmas decorations. 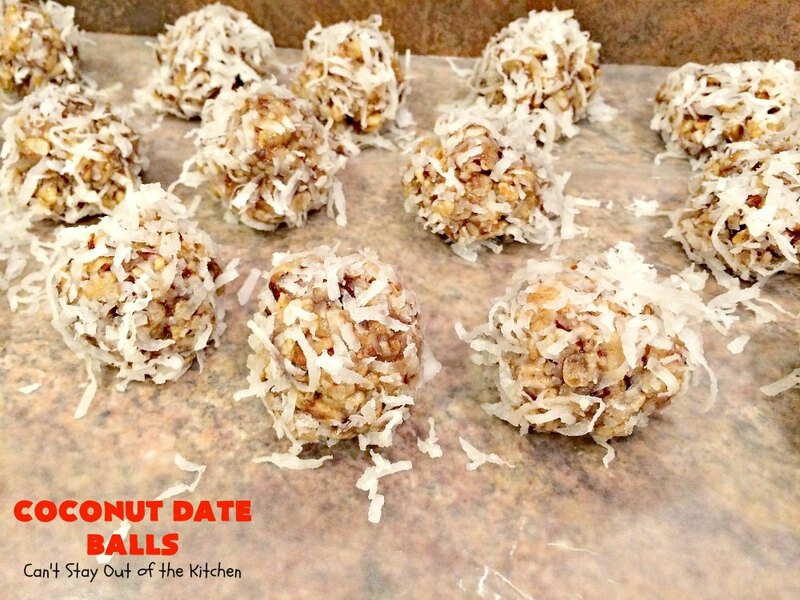 Coconut Date Balls are amazing. We love to make these for Christmas cookie gifts every year. 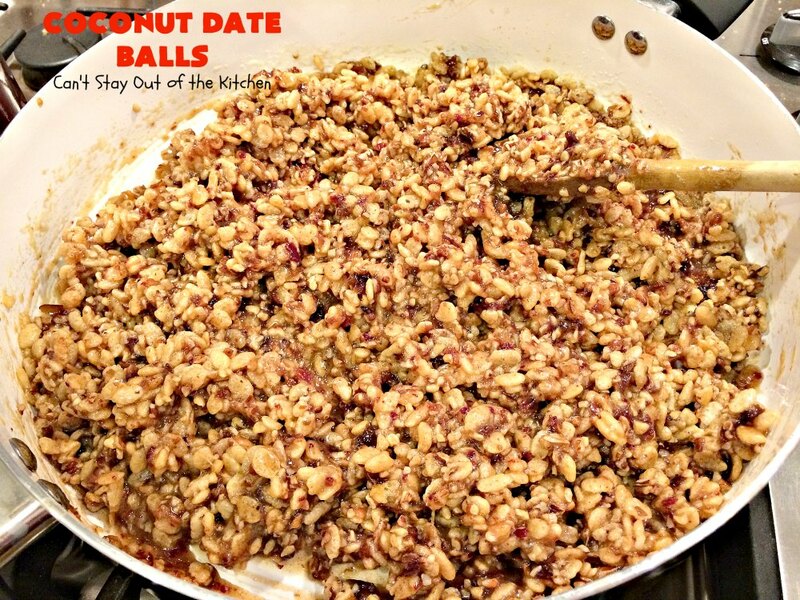 Coconut Date Balls have dates and pecans in a Rice Krispie texture and then covered in coconut. No bah humbug at our house! We love sharing these treats with others. Melt butter over a low heat. And, I really mean LOW! Whisk eggs together and add to butter in skillet. If the heat is too high you will cook the eggs, so you really have to have a low heat to make this work. Add sugar and dates. Stir to combine. With a potato masher, mash the dates down while slowly cooking. This will take at least 10-20 minutes depending on your heat. You don’t want the mixture to scorch and you certainly don’t want the eggs to cook and become scrambled eggs! This is one of those recipes you kind of have to baby along. As the mixture continues to cook the dates will start breaking up and become soft. I continue to mash while cooking to break the dates up into small pieces. Cook date mixture until thickened and the pieces are small due to mashing. After the dates finally get soft, turn off heat. Add vanilla, Rice Krispies and nuts and stir into the mixture. Stir all ingredients together. Cool a few minutes. In order to roll these easily you MUST have moist hands. Place a water bowl next to your coconut bowl and Rice Krispie mixture and keep your hands moist while rolling. Shape the date mixture into a ball a little smaller than a golf ball. Place ball in a bowl of coconut and roll, pressing the coconut into the date mixture as well as possible. 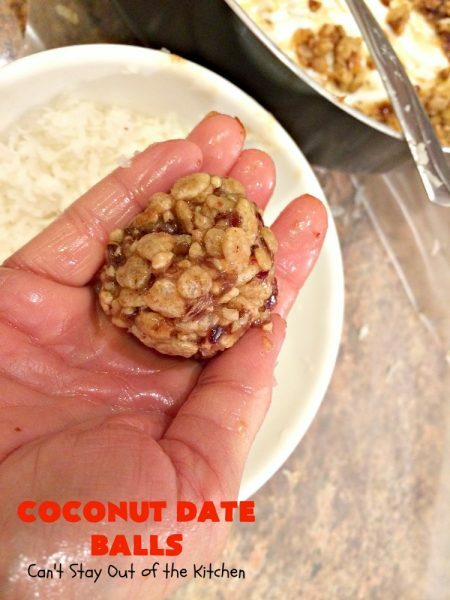 Place the date ball into coconut and roll to cover with coconut. The cheap Wal-Mart brand of coconut actually adheres to the date mixture better than name brands – perhaps because they are a little drier. 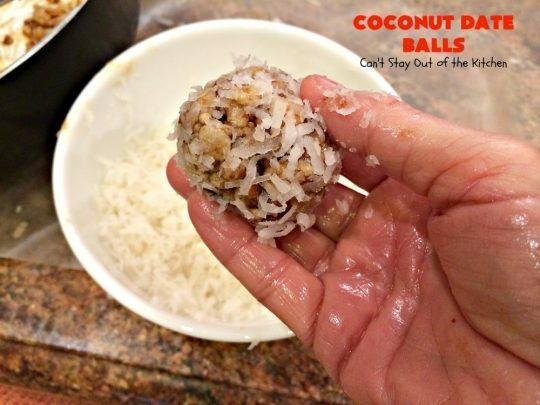 It’s important that you keep the coconut dry and not let water drip into it from your hands. That helps the coconut adhere more easily. Place Coconut Date Balls on a tray with waxed paper when finished. Allow to set before serving. Pack these up quickly or you won’t have any to share with friends. They are THAT good! 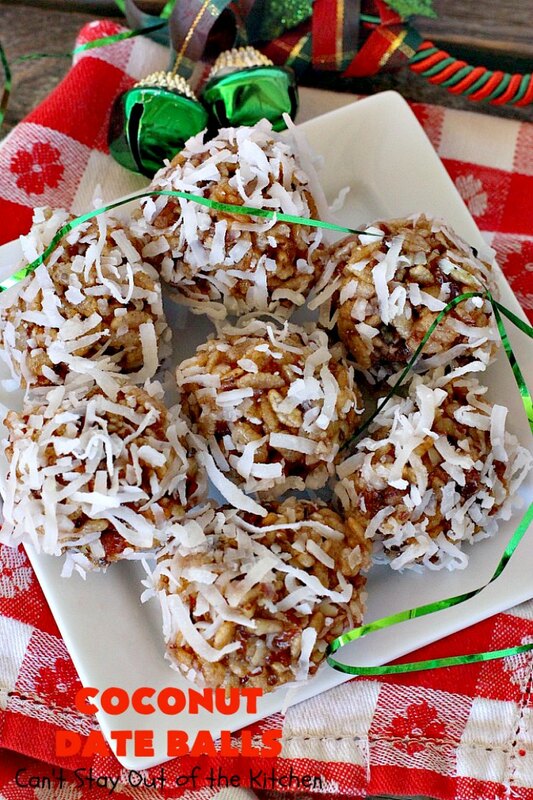 Coconut Date Balls are such festive, beautiful cookies. Your company will go crazy over these family favorites. 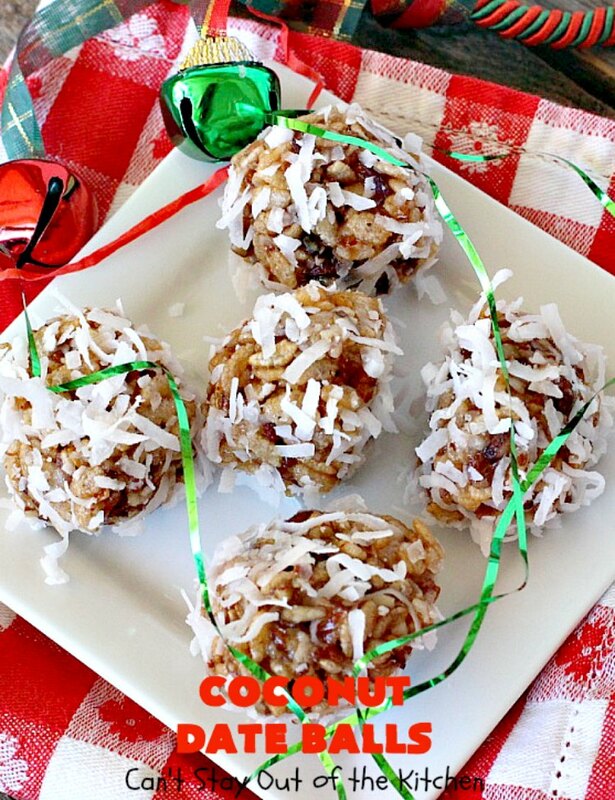 Coconut Date Balls are perfect for Christmas Cookie Exchanges and other holiday parties. This no-bake cookie is great for holiday entertaining. It contains dates, pecans and Rice Krispies and is rolled in coconut. 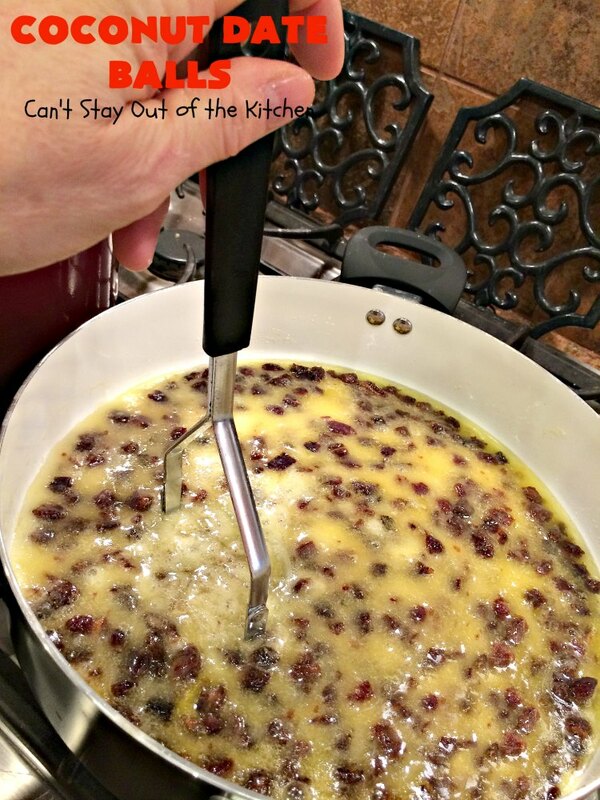 Melt butter in skillet, add eggs, sugar and dates. Slowly mash dates while cooking. Add pecans, vanilla and Rice Krispies. While warm, roll and shape in small balls. Keep hands moist while rolling. NOTE: This recipe is gluten free if you use gluten free Rice Krispies. But these are very difficult to locate since most brands use barley malt flavoring or malt flavoring. I purchased these at Sprouts. But Whole Foods and Trader Joe's may also carry a truly gluten free rice krispie cereal. NOTE: My mother-in-law referred to these as "Skillet Cookies." NOTE: It is helpful to keep the coconut dry while rolling the date balls into them. If you drip too much water from your hands into the coconut it will no longer adhere to the date mixture. NOTE: Keep your hands moist while rolling balls. 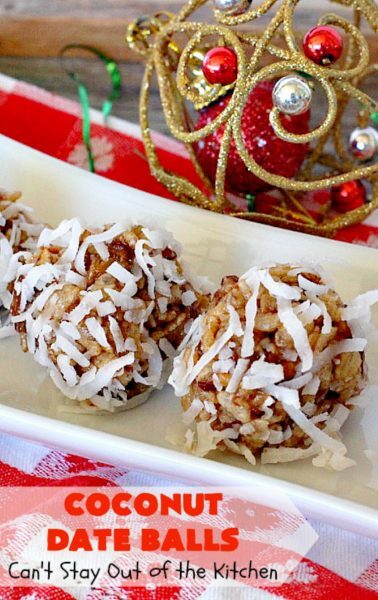 This no-bake cookie is great for holiday entertaining. It contains [url href=”http://www.amportfoods.com/products.html” target=”_blank” title=”amport foods dates”]dates,[/url] pecans and [url href=”http://www.ricekrispies.com/” target=”_blank” title=”rice krispies”]Rice Krispies[/url] and is rolled in coconut. This recipe is gluten free if you use gluten free Rice Krispies. 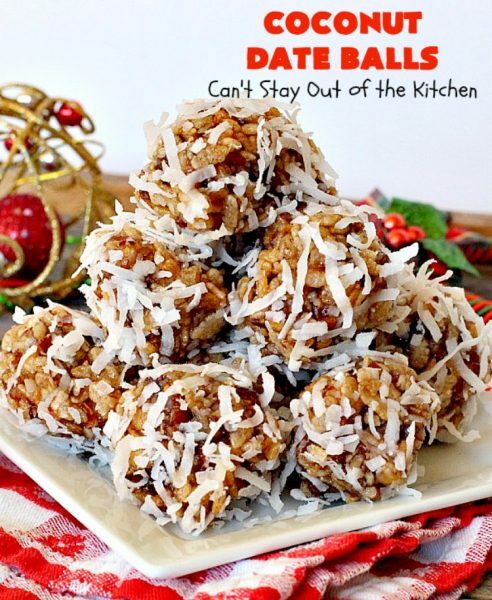 [br][br]My mother-in-law referred to these as “Skillet Cookies.”[br][br]It is helpful to keep the coconut dry while rolling the date balls into them. If you drip too much water from your hands into the coconut it will no longer adhere to the date mixture. We can’t forget to keep Santa and his reindeer happy! 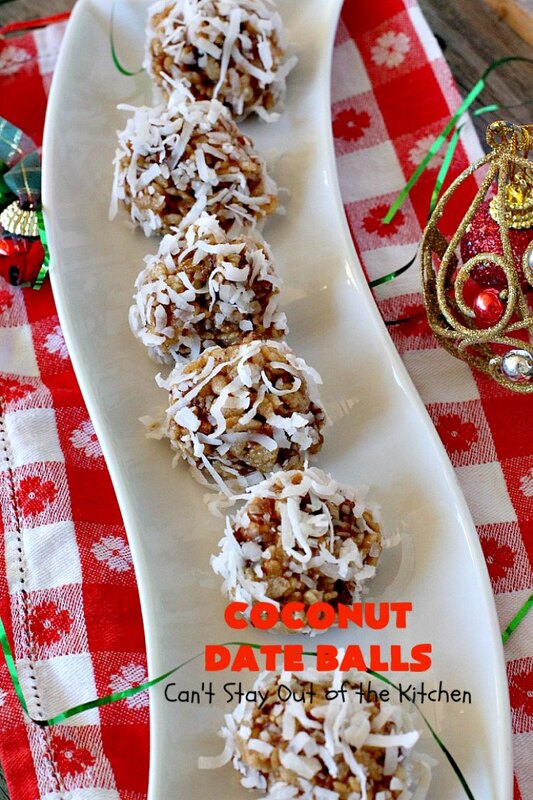 Coconut Date Balls are so wonderful for holiday entertaining. Everybody loves them. If you enjoy Rice Krispie treats, you will love Coconut Date Balls! Is there any way to omit the egg? Hi, Marianne. We’ve never made this without the eggs. I believe vegans try using flaxseeds mixed with water, but I’m not sure how those would turn out. Learned to make these in Home Ec 40 odd yrs ago they were called Angel cookies then. One of the best cookies I ever ate. Still one of my favorites. Yes, they are some of our favorites as well. We make them every year for Christmas. Can you make these ahead of time and how long with they stay for? Also, will the rice krispies soften if I do? Hi, Shereen. We’ve made these every year for Christmas for the last 40 years. We usually freeze them and they seem to do really well. I recommend packing the in plastic containers with waxed paper separating each layer of cookies. I love this recipe! I make them every year. 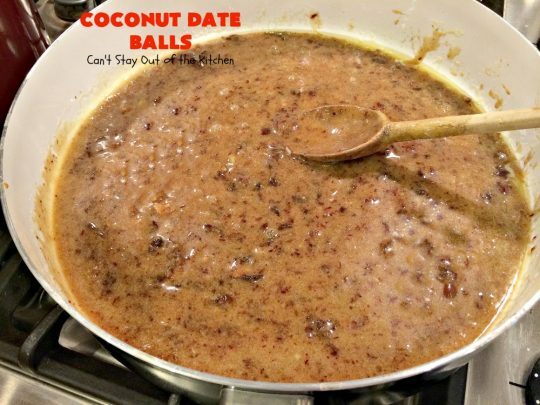 I omit the sugar because the dates and coconut are sweet. The taste is superb! They really are family favorites. Thanks for sharing. Have a great weekend. I made these today! We always call them no bake date cookies My Grandma’s recipe only calls for two tbls of butter. We roll them in powdered sugar and flatten with a glass. Add a pinch of salt just to curb the sweet. (I didn’t…needed) YUMMY! So glad you enjoyed them Michelle. We love these cookies for the holidays, too. We make these at Christmas every year. I stir in some chopped marischino or candied cherry after I’ve cooked the dates for some added festive color. (note: If you use marischino’s you need to drain them really well or they won’t stick to the balls.) Yum-o! Look no further bakers. 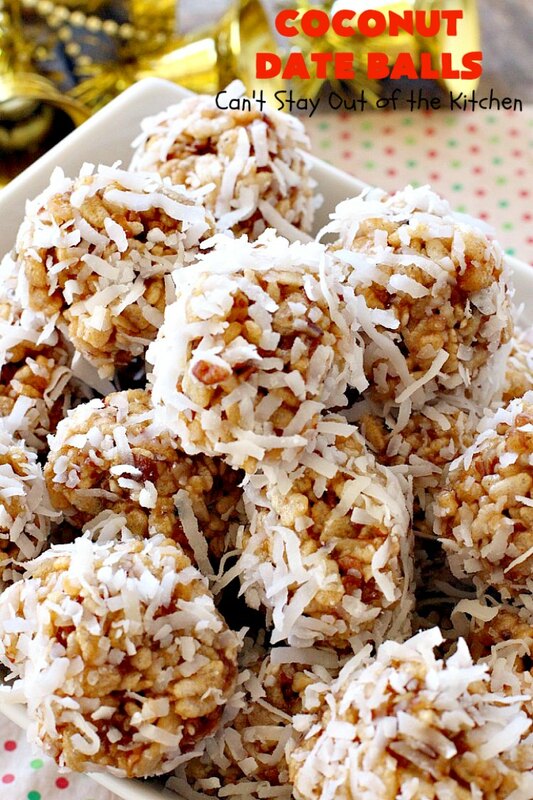 This is the PERFECT recipe for Coconut Date Balls. PERFECTION INDEED. Made a batch yesterday to give to my friend who needed 5 dozen cookies for Sunday church service – my good deed for the day. Today I just finished making another batch for my hubby. This recipe is identical to my Mom’s recipe that she made for us as wee children. A wonderful recipe passed down from generation to generation. Thank you for sharing Teresa. Thanks, so much for your sweet comments, Darlene. You made my day! We really love this recipe and have made it almost every year for Christmas for over 35 years! It’s always one of the favorites that get picked out of our Christmas cookie baskets first!
. . . oh, and to keep our hands from sticking to the balls, we would rub them down with butter! Great idea, Lizzy. Thanks for the tip. I have been making this forever, my Nannie used to make them. The super fun thing to do was get some food coloring and color the coconut. We’d mix ’em up and invent all sorts of colors, they made a beautiful platter for parties! Oh, Lizzy, I LOVE the idea of coloring the coconut. That would make a beautiful holiday tray with greens and reds. I’ll have to try it the next time we make this recipe. Thanks for stopping by my blog. Reminded me of my grandmas skillet cookies. Loved them. I just used half a stick of butter. Also used a cookie ball scoop so didn’t stick to hands. Great idea, Marsha. We’ll have to try that sometime. Glad you enjoyed the cookies. Awesome recipe!!!! Not a fan of coconut so I rolled in confectioners sugar. Water trick – VERY helpful. I’ve tried to make these before with an old recipe from my aunt but they always started falling apart during th rolling process. THANK YOU!!!!! Thank you so much. I’m so glad they worked for you with the confectioner’s sugar instead of coconut. We’ve made this recipe every year for the past 35 years and my husband is usually the one who ends up making it. He asked me to include all the tips that he uses when he makes it. So when I updated the recipe last month, I included those tips. I’m glad you found them helpful. Thanks so much for stopping by and letting me know you enjoyed them. They are so, so good! The directions are awesome. The tips are so helpful ensure they come out right (example: hands must be most to roll them out). Thanks so much. I’m so glad you enjoyed them, Dani. We make these jewels every year for Christmas and everyone just loves them. too many pages in print out. Steve, the print option in the easy recipe card should only print the one page. They are so delicious. Hope you try them sometime. I made these tonight. Do they need to be stored in the fridge? Not necessarily for a few days, but it won’t hurt to store in the frig. OMG I can’t wait to do these for a dinner party. 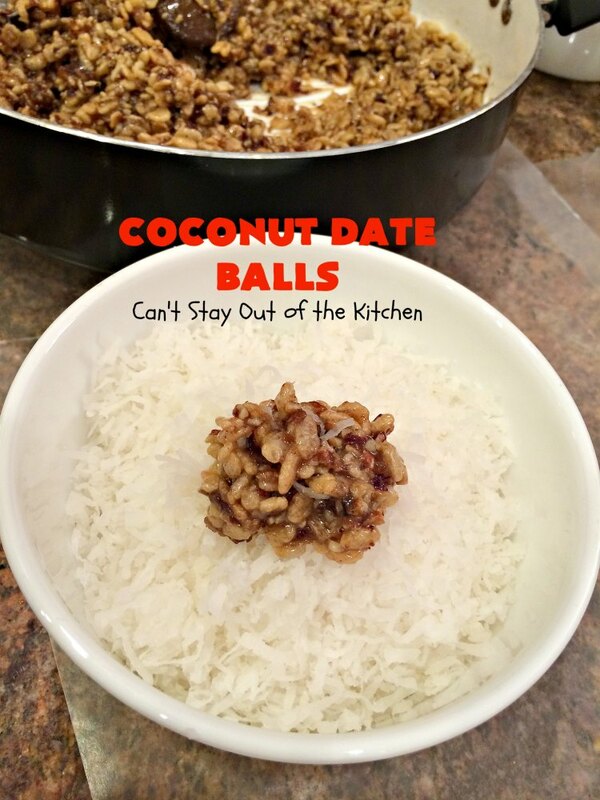 Coconut, dates, and crunch? yum! They are so wonderful. We love these treats. You may want to look at all the little tips we’ve made in the blog post about making them. It will help the process some. They are amazing. They freeze really well, too. Your company will love them. 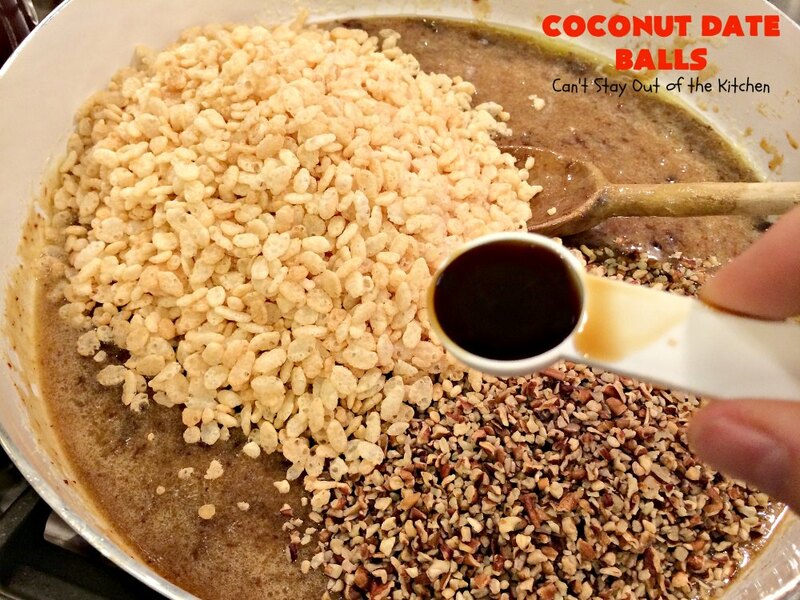 To freeze, do I complete ball even in coconut before I freeze? Hi, Lauressa. Yes, I would freeze them totally made (which is the way I usually do it). Thaw about an hour before you want them ready to go. You can freeze in zip lock bags or in plastic containers. Have a Merry Christmas. You had me at “coconut.” And dates–yum! This recipe is so-so yummy! You will love it.